A cosmic mystery around the star named 49 CETI has puzzled astronomers nearly two decades, but it may finally be solved. At 40 million years old, the star is quite ancient, and yet it's surrounded by a tremendous amount of gas — a signature feature of young stars that usually fades within 10 million years, scientist say. So what keeps 49 CETI looking young? A new study suggests that a prolific number of comet collisions are rejuvenating the star's fresh appearance. So many comet collisions, in fact, that the crashes have occurred every six seconds for the past 10 million years. A team of astronomers reports that gas surrounding 49 CETI can be explained by a massive disk-shaped region around star that is similar to our solar system's Kuiper Belt. The belt around 49 CETI is 4,000 times more massive than our solar system's Kuiper Belt, which lies beyond the orbit of Neptune, and is packed with more objects constantly crashing into each other. "Imagine so many trillions of comets, each the size of the UCLA campus — approximately 1 mile in diameter — orbiting around 49 CETI and bashing into one another," study researcher Benjamin Zuckerman, a UCLA professor of physics and astronomy, said in a statement. 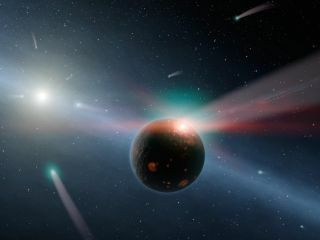 "These young comets likely contain more carbon monoxide than typical comets in our solar system. When they collide, the carbon monoxide escapes as a gas." Zuckerman and his colleagues calculated that these comets crash into each other around 49 CETI about every six seconds. What's more, they estimate this has been going on for a long time. "I was absolutely amazed when we calculated this rapid rate," Zuckerman. "I would not have dreamt it in a million years. We think these collisions have been occurring for 10 million years or so." Zuckerman and his colleagues had discovered the gas that orbits 49 CETI back in 1995 using a radio telescope in the Sierra Nevada Mountains of southern Spain and had been trying to explain its origins ever since. The group says they only know of one other old star that's surrounded by so much gas, but it's considerably younger than 49 CETI at 30 million years old. The new research was detailed in the Sept. 27 edition of the Astrophysical Journal.